Did that sound like Greek to you? Startups raise money from investors to accelerate their growth into, hopefully, massively profitable businesses and/or massively large acquisitions from big companies. One particular type of investor that invests in startups is called an angel investor. An angel investor is often an individual human being who is wealthy, frequently as a consequence of successful entrepreneurship. They invest anywhere from $25,000 to $250,000 or so. Fundraising is painful, and requires a lot of time and focus from startup founders. To mitigate the pain, it is often structured in terms of “rounds”, where the startup goes out to raise a particular large sum of money all at once. For an angel round, let’s say that could be a million dollars. (n.b. It is trending down, as companies can now be founded for sums of money which would have been laughable a few years ago.) Clearly we’re going to need to piece together contributions from a few angels here. Traditionally, one angel has been the “lead” angel, who handles the bulk of the organizational issues for the investors. The rest just sit by their phone and write checks when required. (Slight exaggeration.) Investors are often skittish, and they require social proof to invest in companies, so you often hear them say something like a) they’re not willing to invest in you but b) they are willing to invest in you if everybody else does. This leads to deadlocks as a group of investors, who all would invest in the company if they company were able to raise investment, fail to invest in the company because it cannot raise investment. Startup founders are, understandably, frustrated by this. All numbers below this point were chosen for ease of illustration only. They do not represent typical valuations, round sizes, or percentages of companies purchased by angels. One item of particular interest in investing is the valuation of the company. This gets into heady math, but the core idea is simple: if we agree that the company is worth $100 at this instant in time (the “pre-money valuation”), and you want to invest $100, then right after the company receives your investment, the company is worth $200 (the “post-money valuation”). Since you paid $100, you should own half the company. The thesis of PG’s essay is that allowing investors to invest at the same valuation is not advantageous to the startup. Instead, by offering a discount to valuation for moving quickly, you can convince investors to commit to the deal early, thus starting the stampede from the hesitant investors who were waiting to see social proof. For example, take the company from earlier. We said it was worth $100 prior to receiving investing, but that is not tied to objective reality. Say instead we’ll agree that it is worth $80… but only with respect to the 1st investor. He commits $20. $80 + $20 = $100, so he gets $20 / $100 = 20% of the company for $20, or $1 = 1%. This convinces a second investor to invest. He says “Can I get 20% for $20, too?” Not so fast, buddy, where were you yesterday? The company isn’t worth $80 any more. We think it is worth $105 now. (Did we just get through saying $100? Yes. But valuations are not connected to objective reality.) So you get $20 / ($105 + $20) = 16% of the company for your $20. Think that is fair? You do? OK, done. This continues a few times. The startup raises money — possibly more money, depending on how much the angels want in — with less hassle for the founders. What Is A Convertible Note? Why Do Founders Like Them? We’ve been talking about just dollars so far, and alluding to control of the company as if it were equity like stocks, but there is a mechanism called “convertible notes” at play here. A convertible note is the result of a torrid affair between a loan and an equity instrument. It looks a bit like Mom and a bit like Dad. Like a loan, it charges interest: typically something fairly modest like 6 to 8%, much less than a credit card. How Do You Calculate The Equity Value of A Convertible Note? For example, continuing with our “low numbers make math comprehensible” startup, let’s say it goes on a few months and is then raising a series A round, which basically means “the first time we got money from VCs”. We’ll say the VC and startup negotiate and agree that the company is worth $500 today, the VC is investing $250, ergo the VC gets a third of the company. After this is over, the convertible note is gone, and our angel investors are left with just shares (partial ownership of the company), which they probably hold until the company either goes IPO or gets bought by someone. So if the company later gets bought for $2,000 by Google, our intrepid angel investor makes $66 on his $20 investment. How Does A Valuation Cap Work? Angels ultimately benefit from higher discounts to the valuation of the Series A round, and lower valuation caps. Higher discounts, and higher effective discounts, mean you get more of the company for less money. That is an unambiguous good, as long as you keep the quality of the company constant. Let’s see how valuation caps affect how much of the company you end up with. The better the company is doing by Series A time, the less of the company the angel ends up with. This shows the incentive for the founders: do as well as you can prior to raising money, which is the same incentive founders always have. 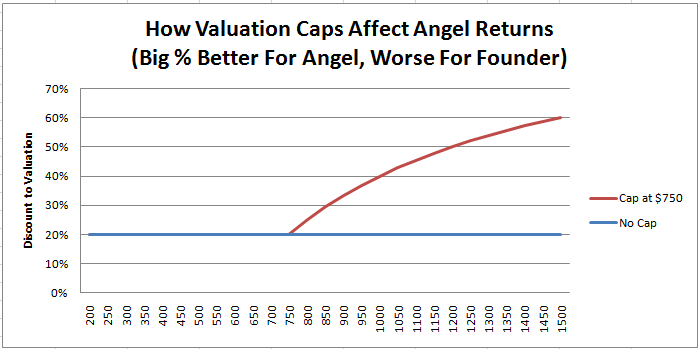 As you can see from the below graph, a valuation cap essentially gives the angel an artificially higher discount for if the Series A valuation exceeds the valuation cap. Obviously then, it is in the interest of angels to negotiate as low a cap as possible, and in the interests of founders to negotiate a high cap or no cap at all. According to Paul Graham, this becomes the primary “pricing” mechanism in the new seed financing economy: if a founder wants to reward an angel, they award them with a lower cap. If they don’t, the angels get a higher cap, or no cap at all. This kicks discussions of valuations down the road a little bit, and allows you to simultaneously offer the company to multiple angels at multiple “price points”. That allows you to reward them for non-monetary compensation (mentoring, having a big name, etc) or for early action on the deal. This Is Not My Business. Take With A Grain Of Salt. Lest anyone get the wrong impression, my familiarity with angel investing is very limited and, to the extent that it exists, it is mostly about angel investing in small town Japan. (Oh, the stories I can’t tell.) The above explanation is based on me processing what I’ve read and trying to prove that I understand it by explaining it to other people. If I have made material errors, please correct me in the comments. My current business is not seeking funding (and would be an extraordinarily poor candidate for it). I’ll never say never for the future, but for the present, I rather like getting 100% of the returns. When I started this blog four years ago, I never thought it would be seen by more than a few dozen people, so I never planned any sort of information architecture to it. 500 posts (300,000 words!) and several hundred thousand readers later, it is unwieldy to get to the good stuff unless you have been following along for the last couple of years, or have a week free. To make this a little less annoying, with the help of an assistant from Hacker News I found the best 72 articles I’ve written, grouped them by category, and for ones which are logically related explained what the connections are (in particular, for the “experiment” / “results” pairs).